AMD FreeSync is a useful open technology that helps synchronise your graphics card frame output to the refresh rate of the monitor. The technology, similar to Nvidia's proprietary G-SYNC, is claimed to help ensure "No stuttering. No tearing. Just gaming." Unlike Nvidia's system, the monitors that are FreeSync enabled require no (expensive) custom licensed hardware and the list of available displays thus has grown rather quickly. So how can you choose the right AMD FreeSync compatible monitor if you can't see the wood for the trees? 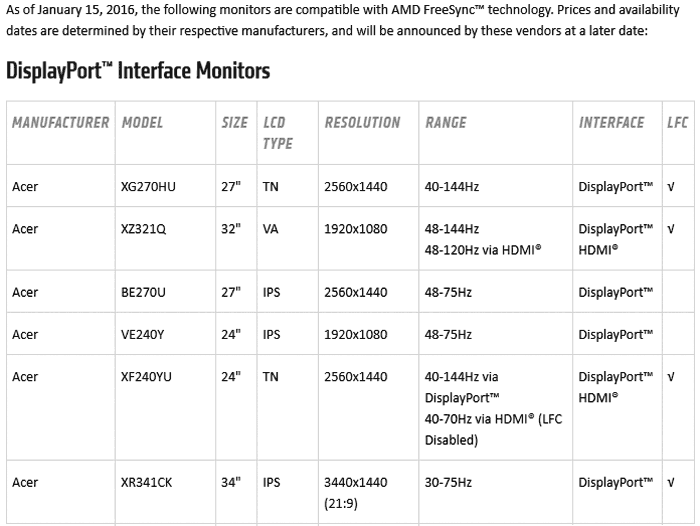 AMD has updated its FreeSync technology pages to list all of them (as of 15th January, 2016) in a table with manufacturer, model number, screen size, LCD type, resolution, refresh range(s), interface and Low Framerate Compensation (LFC) support. Using this very long, manufacturer alphabetically sorted, table could help you choose the right FreeSync monitor for your purposes. To show you an example of the table I've top-sliced a screenshot showing a few Acer FreeSync monitors, above. 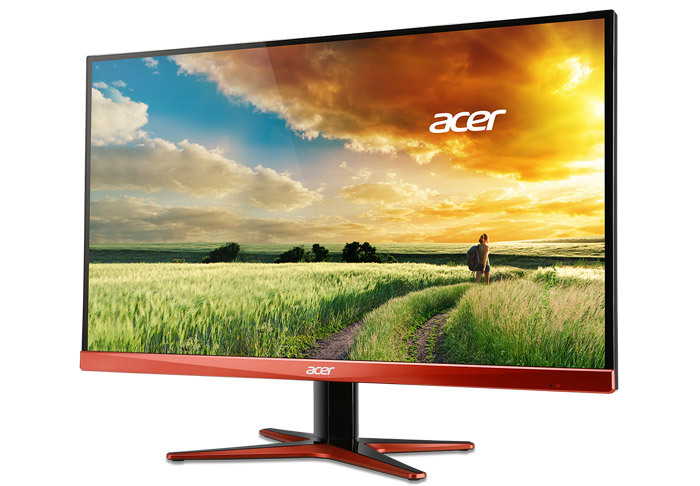 Acer alone has 16 compatible models. There are also lots of models listed from the likes of AOC, Iiyama, LG, Samsung, Viewsonic and others. Screen sizes range from 21.5-inches and 1920x1080 pixels, to 34-inches and to 4K UHD models, with various panel types such as IPS, TN and A-HVA. Interestingly, a number of the monitors are yet to launch/become available. You can find the full monitor table here, scroll a third of the way down the page and select the monitors tab. AMD has taken the opportunity to update its FreeSync technology pages with information about its new Low Framerate Compensation (LFC) algorithm which the FreeSync monitor table flags as compatible, or not, with a tick. This is a new feature of the Radeon Software that extends FreeSync smoothness down to 30fps or less, particularly helpful to those with lower power GPUs, or a monitor with a resolution a bit far advanced of their GPU sweet spot. 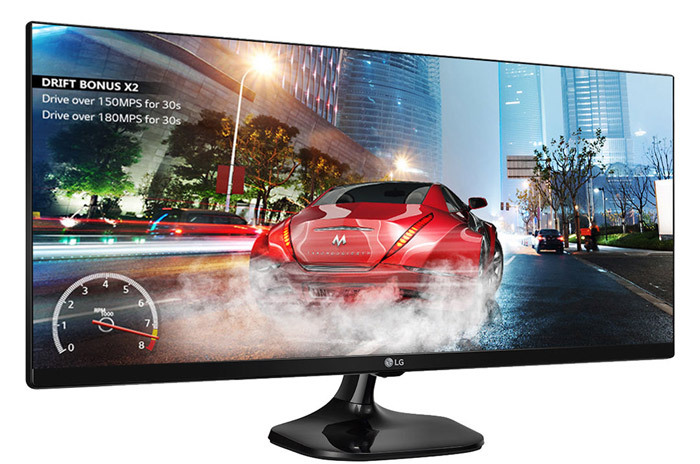 when will we have a monitor with dual function support of Gsync and Fsync inbuilt? I expect Nvidia would hate someone even trying it. This seems quite out of date already. Hexus reviewed the Asus MG248Q monitor as being freesync but it's not there. Interested to see how many HDMI monitors are listed already. Intel need to get in on this, it does help smooth out lower frame rates.